The first heavy showers of the monsoon arrived on Sunday with the temperature going down drastically, there have been reports of water logging from many new areas apart from the low lying areas reported each year. Rani Chennamma circle was flooded, the Udyambag road opp Renaulat and Nagshanti Showroom was flooded which is strange. The road next to Bemco was also flooded and water logging was seen. Road next to Foundry cluster also saw water logging partly. Bhoi Galli Pangul galli corner was again water logged and water has entered some shops as well. Water entered homes in Bhaygaya Nagar 2nd cross with about 1-1.5 feet water. The potholes are slowly raising up at the same places they appear each year and they more prompt in coming to fore as early as possible thanks to wonderful work by the contractors. 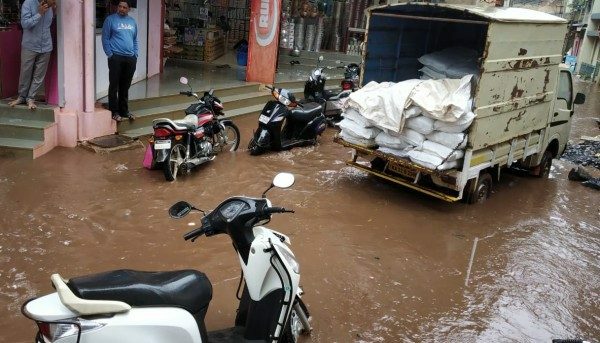 Half of the Khanapur Road near Sanchayni Circle is inundated and there is huge about 8-10 inches deep pit created in the centre of the road which is water logged. This is driving on that road very dangerous.